Home > A full time pet with a lot of love to give. A full time pet with a lot of love to give. Do you have an awful lot of time to devote? Do you mind having a pet that is extremely loud? Do you want a pet that will love you unconditionally, crave your attention, but also possibly hate everyone else in your household? Do you have nearly 70 years to devote? The Nanday Conure is an incredibly rewarding animal to have in your life, but they are very full time. The bird will need to be out of their cage for many hours a day, and despise being left alone. They are also incredibly loud and do love to hear themselves. They have an adorable chatter and can form some words, though very garbled. This is not a bird who will talk to you, imitate you, or sound like a telephone. They are beautiful birds, with very bright green plumage, stark black heads, and adorable little red tufts of feathers around the tops of their legs. They are also incredibly loving. My Nanday Conure Princess loved to kiss, cuddle, and garble little chirps in my ear affectionately. She was a rescue bird whose previous owners were not ready for a bird like her, and so she came to live with me. She adored to take baths in the sink, and was happy to sit on my shoulder while I worked at the computer. Princess, like many birds, was a one person bird. She not only disliked other people, she actively tried to trick them into getting near her so that she could bite them. Remember, birds are very intelligent, and love to play tricks. 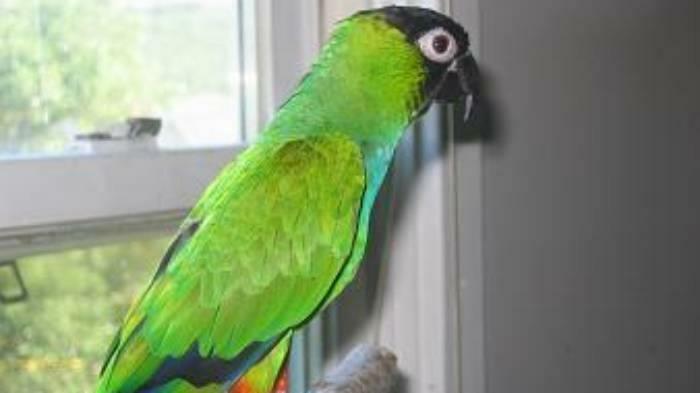 A Nanday Conure would be a wonderful pet for someone who is home most of the day, does not live with many people (or lives alone), and who has a lot of patience and love to give to them. You also must consider the amount of noise you can tolerate in your home. Princess has gone on to live in a place with many other birds like her, and lives a very happy life. Please be sure that this is the right sort of animal for you before you bring one into your life. They will likely outlive you, and if you change your mind about them, they may be forced into rescue care.